Ghpage.com extensively reported on the accident Kumasi Asante Kotoko was involved in at a location near Nkawkaw in the Eastern Region while returning to their Kumasi base from Accra after honoring a league match against WAFA. Many casualties were recorded including the death of the equipment officer of the Kotoko Team.Mr. Thomas Asare Obeng’s death was luckily the only death recorded in the gruesome accident. A befitting burial is currently being held at Heroes Park in Kumasi is bid him farewell. 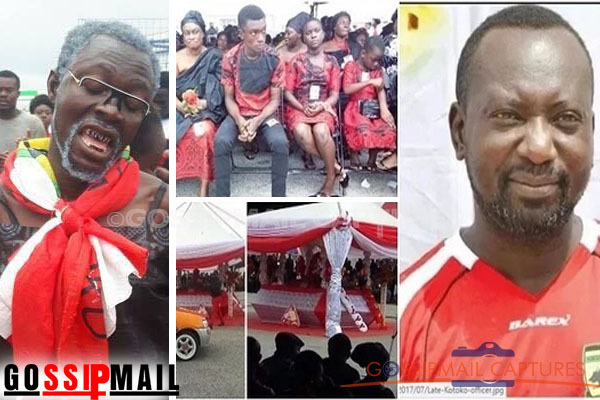 The funeral is heavily attended by supporters of Asante Kotoko, the team, and management.